For one quarter, Cavs again deliver hope. But what now? Cleveland Cavaliers point guard Kyrie Irving had 32 points in a loss to the Celtics Saturday, but questions remain how the team will react to the uncertainty surrounding the Andrew Bynum situation. Something major has changed for them, and we won’t know the final answer for quite some time. All we knew after Saturday afternoon was center Andrew Bynum was suspended "indefinitely" and the Cavs dropped a 103-100 decision at Boston that came down to a last shot. Brown calls Bynum situation 'internal matter"
That final part was somewhat surprising, too — especially since the Cavs trailed by19 points entering the fourth quarter. How they got there was their own fault. They didn’t really defend or rebound or make shots. They’re actually lucky the deficit wasn’t greater. Then the fourth quarter happened and so did the Cavs. It was among their finest 12 minutes of the season, and for that, they deserve credit. Now all they need to do is carry that to the rest of the season. Like most things with the Cavs (10-19) these days, it’s a wait-and-see proposition. As for Saturday, the Cavs’ outburst became official when Jarrett Jack buried back-to-back 3-pointers to cut the deficit to 98-94 with just less than 3:00 left. About two minutes later, the Celtics’ lead was trimmed to 102-100 after free throws Dion Waiters. Then Celtics forward Jared Sullinger shot an air ball that sailed out of bounds. Cavs ball, 19.3 seconds left and things are looking up. But when Waiters was fouled on the ensuing drive, no whistle blew. It looked like a clean block by Celtics forward Brandon Bass, but replays showed Bass got Waiters on the arm before Bass got the ball. No call. This is a call Houston guard James Harden would’ve received, that’s for sure. Harden shot 25 free throws in a game Thursday. That total was more than the number compiled by four entire teams on that night — and just one less than the Cavs in a double-overtime game. Translation: Please, please, please, incoming NBA commissioner Adam Silver. Clean up this game and the shadiness and one-sidedness that so often surrounds it. Anyway, the Cavs waited too long to foul after Waiters’ miss (or Bass’ foul, however you want to look at it). By the time the Celtics shot their free throws, only 1.3 seconds remained. They made just one of two, however — and the Cavs got another (sort of) chance — but Earl Clark never got off the shot and that was that. Kyrie Irving led the Cavs with 32 points in one of his best performances of the season. Waiters added 17, Jack scored 14 and Anderson Varejao grabbed eight rebounds starting in place of Bynum. It seems highly likely Varejao will keep the job for the rest of the season, as Bynum appears on his way out — both of Cleveland and possibly of the league. Well, here’s your answer: Who knows? 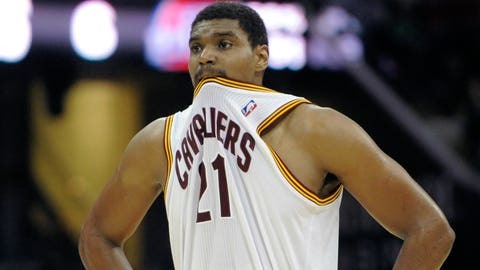 On the bright side, the Cavs appear to be on their way to a roster change following the whole Bynum ordeal. They could probably use one, because Bynum wasn’t really helping matters. On the downside, we still don’t know a whole lot about this team, and we’re only about 10 games away from the midway point of the season. We had hoped to know more, to know how far this team can go. Coaches, players and fans are hoping it resembles something really close to Saturday’s fourth quarter.